All protein treatments are not created equal. 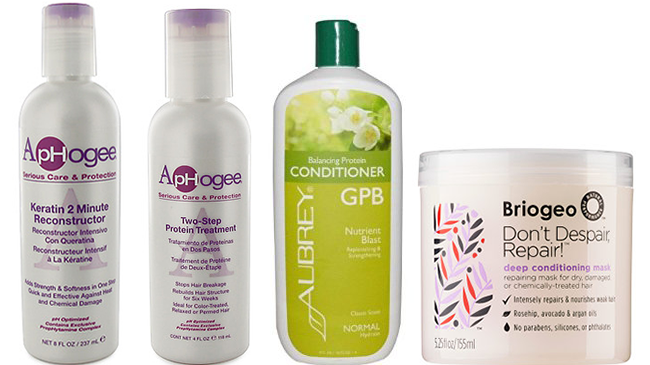 Curly, coily, and wavy hair relies on a perfect balance of oils, nutrients, moisture, and proteins. Proteins are large molecules consisting of amino acids that our bodies and cells need to function properly, according to Owner of Medical News Today Christian Nordqvist. Proteins play a role in virtually every biological process including hair. Keratin, which hair is made of, is a strong protein that can break down with sun exposure, wind, pollutants, daily maintenance, manipulation, heat tools, and chemical treatments like permanent color. This is where using protein treatments come in to help temporarily repair the hair strands. Protein treatments are used to add strength and resiliency to damaged hair by attaching hydrolyzed proteins directly to the hair follicle and hardening the cuticle layer. If there are holes in the hair cuticle, it will fill those holes or gaps while also placing a barrier around the hair shaft to lessen further damage. Most protein treatments are conditioning treatments. They can come be a deep conditioner, light, or reconstructor (heavy). There are several types that cater to your specific needs, but we came up with the top eight that will give you the best treatment for even the worst type of damage. You almost cannot discuss protein treatments without mentioning ApHogee. Water, emulsifiers, fatty alcohols, and hydrolyzed proteins make up this hugely popular protein treatment that will prevent breakage and lessen split ends while protecting the hair and adding body. It is a concentrated blend of keratin amino acids, oils, and vitamins made specifically for bleached, tinted, or chemically-straightened strands. Another favorite of curly girls, this two-step treatment will rebuild the hair structure with its unique formula of magnesium and modified proteins. A powerful protein treatment will restore your hair’s elasticity while softening those brittle and dry strands that have been damaged by chemical services and heat. It even helps to remove mineral deposits from swimming pools and hard water. Another favorite, and for good reason, this balancing protein conditioner will feed your hair with a nutrient-rich formula that will rehydrate and strengthen your damaged strands. This is a salon-quality treatment that restores your hair’s softness, manageability, and shine. It is my go-to protein treatment with a scent that is heavenly! A deep conditioning protein treatment, Briogeo Don’t Despair gets much love from curly girls. This intensive deep conditioning treatment delivers an optimal blend of nutrients, vitamins, and natural oils that restore and replenish damaged strands all with 95% naturally-derived ingredients. This mask does not contain parabens, phthalates, sulfates, artificial fragrances, dyes, or gluten. This reconstructor by Crème of Nature is an intensive moisture infuser that strengthens and prevents further hair breakage. Hair is left softer, silkier, and full of body. Perfect for color-treated or chemically-straightened hair. The Hair Chemist Macadamia Oil Deep Repair Masque is a reconstructing protein treatment that punches with the powers of macadamia and argan oil. 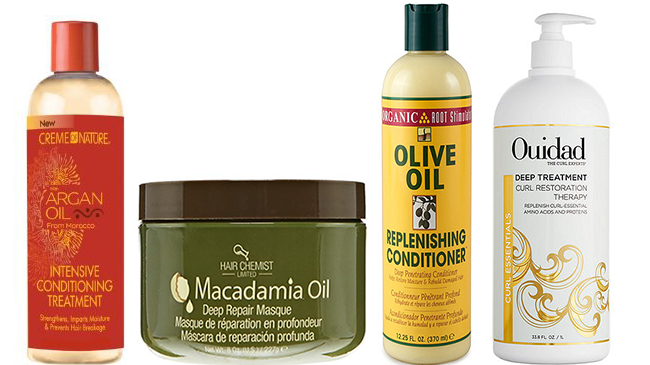 Your dry, brittle, damaged hair also gets tea tree oil, chamomile oil, aloe, and algae extract to nourish and condition while it repairs the cuticle. Replenish your curls with this deep-penetrating protein conditioner that enlists the goodness of olive oil, marine proteins, and sweet orange oil. This treatment will moisturize your strands and improves your hair’s elasticity. Rebuild your damaged hair and stimulate the hair roots for healthier hair. The Ouidad Deep Treatment Curl Restoration Therapy is an intensive conditioner that restores curl hydration, shine, and health to your strands. Added heat from wearing a processing plastic cap, mixed with the proteins and amino acids drive this formula deep into the hair’s cuticle for serious rejuvenation. Gain bounce, luster, and highly conditioned curls.